Today we think of mobile computing as being a tablet, smartphone, or maybe even a laptop. But in 1956 when the United States Army made its request for a mobile computer, the goal was to build a computer that could be transported by truck to the front lines of a battlefield. Considering computers up to this point took up whole buildings, it was a fairly tall order. In the end, Sylvania won the bid and built the “MOBIle DIgital Computer”, or MOBIDIC. The computer was housed in a thirty foot long trailer, and consumed so much energy that a second truck containing a generator had to follow it around. For good measure, two more vans were added to the convoy, one holding spare parts and another a repair shop. It was a far cry from your laptop as far as mobile computers go, but it was still pretty good for the era. [Jeff Salzman] has been fascinated with the MOBIDIC for years, and is currently working on an emulator to bring its unique architecture back to life. As the MOBIDIC was designed at the Camp Evans Signal Laboratory, which is now the home of InfoAge and VCF East, there’s even talk of getting an old Army trailer and building a life-size exhibit to show visitors what it would have been like to work inside of MOBIDIC. At this point [Jeff] is still in the very early stages and was mainly presenting information on how the computer worked and his research, but it all sounds very promising. Definitely a project to keep an eye on. There’s nothing like being in a room full of pre-1980 computers to remind you of just how far technology has come in what’s really an exceptionally short amount of time. Pretty much any exhibit at the show was a sharp contrast to the smartphones most of us now carry, but perhaps the most succinct of them was the “8-Bit Digital Portraits” table run by [Jeffrey Brace]. 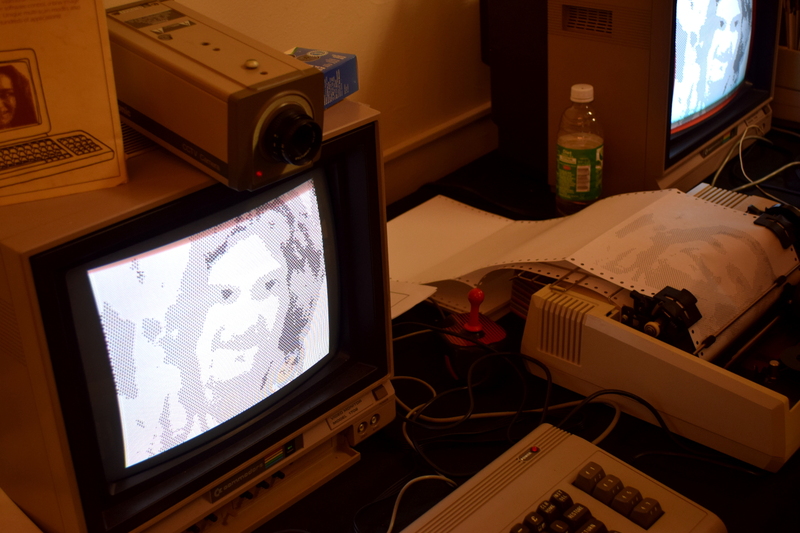 Using an old Panasonic CCTV camera, a Commodore 64, and a relatively rare product called “ComputerEyes”, [Jeffery] would take pictures of willing participants and then print them out on a Star NX-1000 dot matrix printer as a memento. For younger attendees, the whole process was something of a culture shock. With relatively high-end cameras in every smartphone on the market, we take for granted the ability to take a multi-megapixel image on a whim. 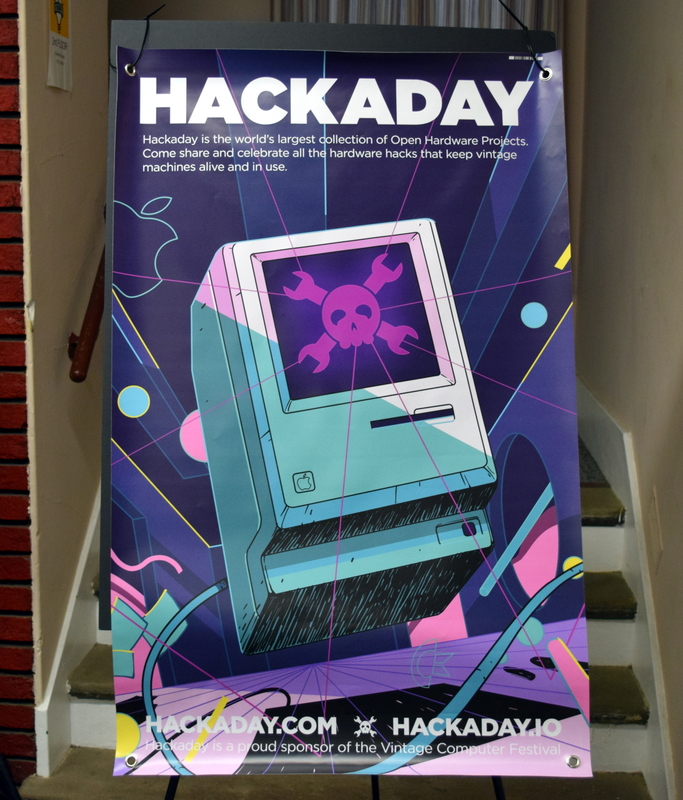 As an interesting aside, the person getting their picture taken by the Commodore when I stopped by the table was [John Sutley], whose work involving the restoration of vintage CRT monitors we’ve covered here on Hackaday before. You can read about the heyday of bulletin board system (BBS), you can even “dial” into some modern ones over the internet, but there’s nothing quite like using a BBS on vintage hardware and at vintage speeds. Just in case anyone forgot what it was like actually sending messages on one of these systems back when they were all the rage, [Michael Lee] brought in some era appropriate hardware for attendees to use while chatting on the Diversi-Dial BBS. An Apple IIe was running as the host, sporting Hayes MicroModems for connectivity. On the client side DEC VT-100 and 220 terminals were on hand, complete with acoustic couplers. Even for show-goers who were old experienced enough to have used dial-up connections or chatted on the original BBS were shocked to be confronted with the tech again after all these years. Watching messages get typed out character by character got more than a few chuckles from those in attendance. Nostalgia has a funny way of making things seem a lot better than they were. While the actual Vintage Computer Festival East only happens once a year at InfoAge, the Vintage Computer Federation maintains a computer museum there year round which contains an absolutely incredible amount of hardware. From the monstrous Univac 1219-B mainframe recovered from the U.S. Navy to essentially every significant desktop computers from the 80s and 90s, there’s really something for everyone in the collection. Many of the desktop computers are powered up and can be used by visitors, though naturally under supervision by a staffer. Demonstrations are given for the mainframes, allowing those in attendance a chance to see these behemoths at work. Really a must-see collection if you’re interested in computer history and within reasonable distance of the Jersey shore. The consignment room was an absolute treasure trove, with a wide array of items and in some cases preposterously low prices. Those bringing their old hardware to get sold at VCF are obviously in it more to keep the stuff out of a landfill than they are to make a profit for themselves. Respect. Not everything for sale was an old computer either. From classic gaming to test equipment, there were plenty of deals to be had. Not to be confused with the consignment area which was staffed by volunteers, the vendor room was were professional sellers had their wares on display. Here you could find newly manufactured kit computers and electronic gear. Even a few Raspberry Pis were spotted. The vintage hardware that was available in the vendor area was also a bit higher up the scale in terms of condition, but as expected, so to were the prices. The Vintage Computer Festival East XIII was an amazing event, but like all good things, it too had to come to an end. But don’t despair, there’s more vintage computing where that came from. VCF East may be gone until next year, but VCF West will be taking place August 4th and 5th in Mountain View, California. If your next ideal system-upgrade is a paper tape reader, and you can get out to the somewhat less dreary side of the United States, we’d strongly recommend you check it out. My wife, in an effort to avoid doing a foreign language course, took an assembly language programming class (and passed it). Everyone was assigned a KIM-1 and they had to write the assembly code, then hand assemble it. She passed! I knew someone who worked for RCA (in the broadcast division) they were offered some sort of seminar, I assume RCA paying the price. So he went, and it included a KIM-1, but someone else from the company didn’t want to keep his KIM-1, so I ended up with it. Kind of late, it was 1979, but I didn’t have the money for even a KIN-1. Two years later I decided I could spend money on a computer, an OSI Superboard II. Sadly, family obligations took precedence. I’ll try to make it next year..
Looks like Hackaday didn’t make it over to the IXR hackerspace, we were putting together special edition VCF East 8085 single-board computers over there! The special edition 8085 SBC is pure awesome. People have already devised some fun add-ons for it. VCF East is always a blast. This was my sixth one, and it’s become a highlight event of my year. No matter what I do, I find that I miss a few exhibits, and don’t get a chance to talk to everyone I wanted to. Not sure I would qualify them as “absolute garbage” based on that premises. If they are unable to melt the solder, I would consider them absolute garbage. But it isn’t really that hard to find the “sweet spot” even without a temperature readout. It is of course much more practical with a temperature controlled soldering station if you use different kinds of solder.